The Supreme Court has ordered the Electoral Commission to make collation sheets for Presidential elections available to parties and their agents after close of polls. 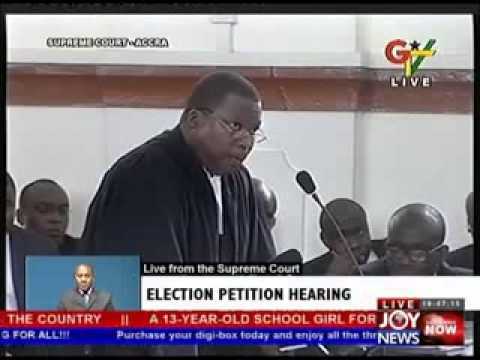 The petitioner who is former Director of Research at Parliament, Kwesi Nyame Tease-Eshun, sought to expose flaws in the new law that governs the 2016 general elections. Under the CI 94, the EC is not obliged to provide copies of the collation sheet to political party agents. The petitioner, represented by Akoto Ampaw described this provision in the CI as an 'absurdity'. CI 94 was meant to deal with flaws in the previous law (CI 74), as exposed in the 2013 election petition. But it appears even the new CI 94 is problematic. Justice Atuguba who read the judgment of the Court on behalf of the seven-member panel directed that the EC confers with lawyers for the plaintiff to rectify the anomaly identified in the CI 94. The legal teams are later to come to court with a resolution after which the Court will adopt the amendment as law. Two regulations in the CI 94 is emphatic that no political party or presidential candidate is entitled to a copy of the 275 collation sheets. The collation sheet is crucial evidence because it is the only proof that shows if the results declared by the EC match the results captured on the sheets. National Collation Centre which shall receive the collated results from all 29,000 polling stations will under the law declare the winner of the presidential race and hand over the documents to the EC. It means any candidate grieved by the results will effectively be unable to challenge the outcome because the aggrieved candidate may have no official evidence to make his case. Even worse, the CI 94 makes no provision requiring the collation forms to be signed by either the Returning Officer or party agents, the petitioner complained. It will be recalled that the 2012 presidential elections was challenged by the NPP in 2013 on the basis that a list of unsigned collation sheets constituted an infraction of the law. Counsel for petitioners confronted the Chairman of the Electoral Commission (EC), Dr Kwadwo Afari-Gyan with 371 unsigned sheets leading to his admission that they are infractions.